When they catch a whiff of a potential meal, sharks determine which nostril caught the scent first and then move in that direction. Sharks turn toward the side stimulated first, even when the other nostril detects a higher odor concentration, notes lead author Jayne Gardiner, of USF’s Department of Integrative Biology. Sharks have long had a reputation as efficient predators with keenly attuned senses, but until now it was thought that they followed the strongest scent when hunting prey. Timing can be a much more reliable tool than odor strength, explains the study’s coauthor, Jelle Atema of the Boston University Marine Program and WHOI. “The structure of an odor plume is chaotic and not at all coherent. It’s just like what you see with the Gulf oil spill, which is essentially a gigantic odor plume. The plume breaks up into pieces, floats to different levels and gets transported in a current,” says Atema. Most often, sharks will hit an odor patch at an angle rather than straight on. So by determining which nostril received the odor first, the shark will automatically steer into the odor patch. The difference in timing between nostrils can be as small as a tenth of a second. 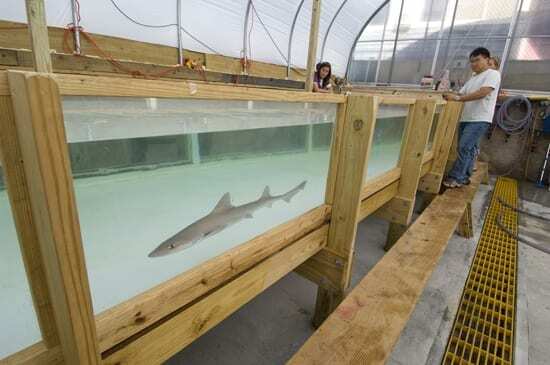 The research team performed the sensory experiments on smooth dogfish sharks (Mustelus canis), which are a small species, fairly common in waters off New England. Doses of odor (squid) were given using specialized headgear with tubes feeding into the sharks’ left and right nostrils. The study, published in the journal Current Biology, is the first conclusive evidence that bilateral time differences trump odor concentration differences in sharks. An earlier study by Gardiner and Atema found that sharks don’t find prey by odor alone. They use what Atema describes as a “fantastically sensitive organ,” called a lateral line, which runs the length of their bodies and picks up vibrations in the water. The sharks use their sense of smell to steer them into an odor plume, and the flow structure to stream those patches together to find the source. A smooth dogfish shark swims in a testing tank in the Environmental Systems Lab at Woods Hole Oceanographic Institution where biologist Jelle Atema and his students are working to understand how sharks use their senses to locate food.